I was surprised, when I arrived, that the show I had come to see was on the smaller Academy 2 stage as I thought Uli Jon Roth would have drawn a larger crowd. The show started with a band called Baranovich, a band named after the lead vocalist. They played a set of what I would describe as straightforward Classic Rock with no pretence, good communication between the front-man and his audience, and well-presented songs. By the time they left the stage, I would say that they had done what they were hired for as the audience was well warmed up. Next up was a trio of musicians that didn't really look like a Rock band. However, as soon as the guitarist started through his Vox AC30 (which was a little overpowering) and accompanied by the keyboards and drums, it became very clear that they were indeed a Rock band. The music they played made me wonder who they reminded me of, and to be honest I couldn't really think of anyone. The only thing I could come up with was Radiohead, just by the way that the songs were arranged and delivered. The guy on guitar – whose name I sadly didn't catch at the time – had a style that made the music modern and vibrant, although a couple of them did go on a bit too long. At the end of his set, I was puzzled by the fact that none of the musicians actually left the stage, but just re-arranged it. I quickly realised that the band I had been watching was three quarters of Roth's backing band, which was confirmed when the man himself walked on to play alongside them. Roth has been around a few years now. Making his presence felt way back in the early seventies as original lead guitarist with the Scorpions, it wasn't long before he was off on his own to start a solo career that is still going strong. However, this tour was called the 'Tokyo Tapes Revisited' tour which suggested that the music tonight would come from the Scorpions live album of the same name. That indeed seemed to be the case when 'All Night Long' kicked off the show, but this was followed by 'Longing For Fire' (from 'In Trance') and then the excellent 'Sails Of Charon' (from 'Taken By Force') which kind of blew the assumption out of the water. Another 'In Trance' song, 'Sun In My Hand', followed in which Roth's guitar was complimented by Ali Clinton, the very guitarist who had played the set previous to this one and whose name I now knew. The rest of the songs from 'Tokyo Tapes Revisited' tonight were 'We'll Burn The Sky' (during which the bass player – who Roth announced was usually the other, other guitarist – broke a string, something which I have never seen before during a performance, forcing Roth into an impromptu guitar piece, for which he was accompanied by the keyboard player, who started off in the wrong key), 'In Trance', 'Fly To The Rainbow', 'Pictured Life' and 'Dark Lady', with Roth's 'Rainbow Dream Prelude' played on a double neck electric which sounded just like a classical guitar. The evening concluded with 'Yellow Raven' and an encore of Jimi Hendrix's 'All Along The Watchtower' for which Roth took on lead vocals. At the end, all I could think was that it was good to see Roth so close due to the small venue, which also made me think how odd as the next time we see him will probably be in arenas on the G3 tour with Joe Satriani and John Petrucci – bit of a contrast wouldn't you say? It would also have been good to hear 'He's A Woman, She's A Man' and 'Steam Rock Fever' which were both on 'Tokyo Tapes Revisited', but I don't suppose we could have everything. 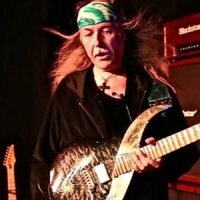 If you are going to a G3 show, I suggest you don't regard Uli Jon Roth as a support to the other two guys, but as a definite equal, so don't miss him.